I’ve mentioned a few times that I watch/make a lot of YouTube videos. I put up two videos just this weekend – a cover of Beside You by 5 Seconds of Summer for ‘Valentines Day’ (it’s not that romantic really) and a video called (Not) Going to Uni? about my experiences with applying for university and other options. But I also love music. So it only make sense that I combine the two and spend a lot of my time looking for new people on YouTube. I stumbled upon Dodie Clark (doddleoddle) through her friendships with people and appearances in other videos. When clicking on her channel I saw an original song called ‘Paint‘ and instantly fell in love. Obviously she’s very beautiful and very, very talented and the more videos I watched the more I adored her – she’s so well spoken and not afraid to share opinions that need to be shared and strong enough to say when YouTube isn’t allowed to know. In her most recent video, (a YouTube Q&A) Dodie was asked what it was like having people know everything about her life and her response was ‘you don’t know everything about my life’ and I felt like punching the air in satisfaction – I love when someone is brave enough to stand up and draw a line in the way I’ve only ever seen in Sprinkle of Glitter before. I admire Dodie Clark so much and her original song ‘Adored by Him‘ is one of my favourite songs of all time. I love acoustic songs that focus on simplicity and a lot of Dodie’s songs as like this – Adored by Him starts with just Dodie and her ukulele, later bringing in a piano and other adorable touches (I think there might be a xylophone). But the most beautiful thing I find in the whole song as the lyrics – Dodie writes such meaningful words that are sweet and relatable and amazing. Particularly in Adored by Him and another original song ‘She‘, they are without a doubt the most lyrically beautiful songs I’ve ever heard. I can’t even find the words for how much I love this song. Dodie is an incredible song writer and even in the few months I’ve been following her she’s learnt so much and improved, not that she was ever bad. 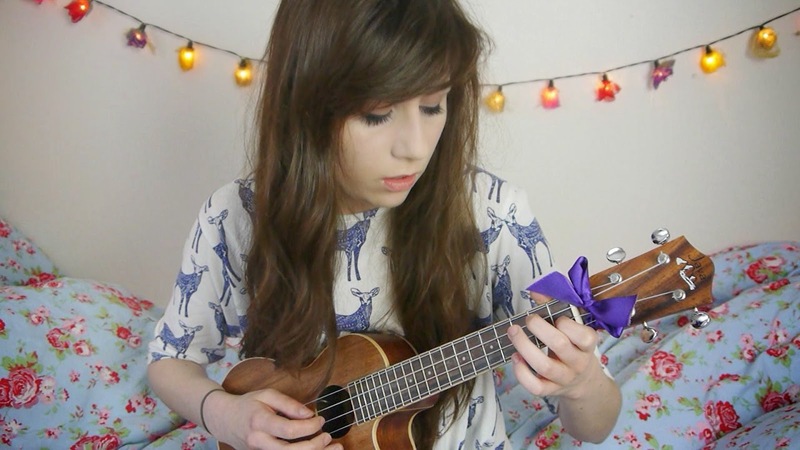 I can’t praise Dodie highly enough – she’s only 19 (I think) and she’s achieved so, so much. Have you found any musicians on YouTube that you adore as much as I adore Dodie? Tell me all about them in the comments!